Warning: Don't try this at home unless your home is on many acres of fenced off area. 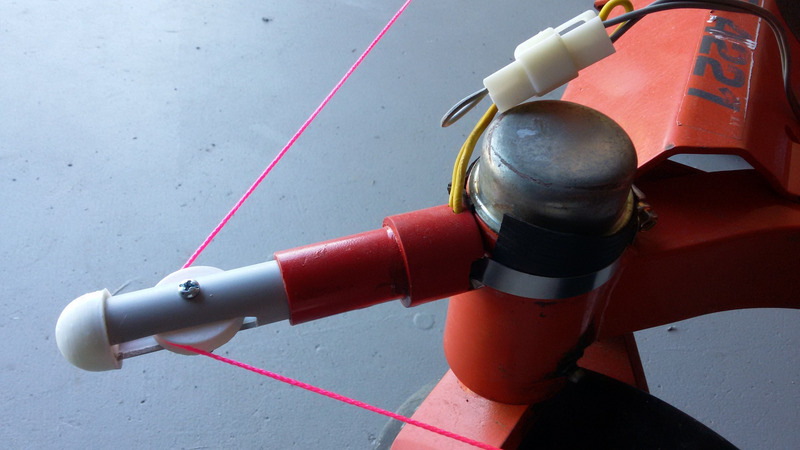 This robot is about as dangerous as agricultural machinery gets. It is not a cute project to work on with the kids. It is 200kg of unforgiving metal powered by 20 horsepower of searing hot engine, with heavy machete-style blades spinning at around 200km/hr. Also, zero-turn / differential drive is much more dangerous than a 'normally steered' rover because it can go in any direction very quickly. Think for a moment about what would happen if you get forward and backwards mixed up on one side or even just got left and right mixed up, and the the mower just started spinning wildly, and ignored the remote control cut-out. How could it be stopped? Anyone thinking of building this kind of robot needs to think these issues through very seriously. And if you are not wearing steel-capped boots you are playing Russian Roulette with your toes. Anyone with an old zero-turn ride-on mower lying around probably wishes they didn't have to actually drive it themselves. 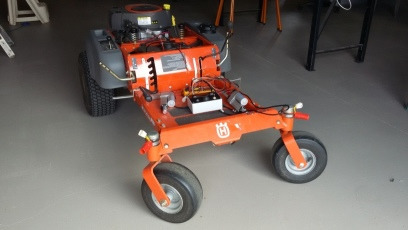 This is a Husqvarna RZ4221, a 'zero-turn' mower which uses a differential drive system - ie the same wheel configuration as the rest of the robots. 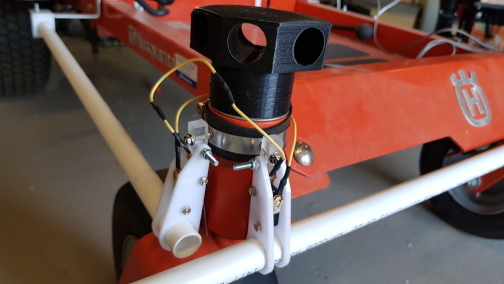 Automating a ride-on mower can be done by replacing the motion control levers with linear actuators to operate the the 'engage' push-rods into the gearbox. 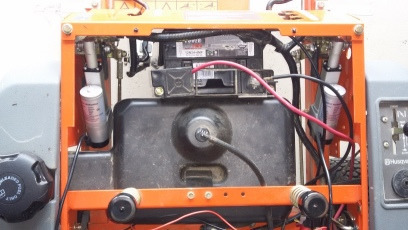 Further the modifications should be possible without making any irreversible changes to the mower - which is desirable firstly because it is serviced annually by the mower shop, who might the refuse to service it if they are confused about the modifications and secondly because the mower can be reassembled and sold as a normal mower - unused ride-on lawnmowers are expensive accessories. 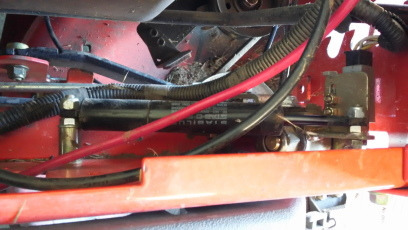 This mower has had the seat removed to allow access to the internals. The mower deck has been temporarily removed to make it lighter and safer during testing. [whinge] By the way, this is not a recommendation to buy this model of mower. It ended up as my 'spare' mower for a reason - ie because I needed a better one. I am not sure whether I have spent more time riding this mower or fixing it, but it would be pretty close. If you are looking to buy a mower, buy something better. Don't buy this model. In fact .. consider a different brand entirely. 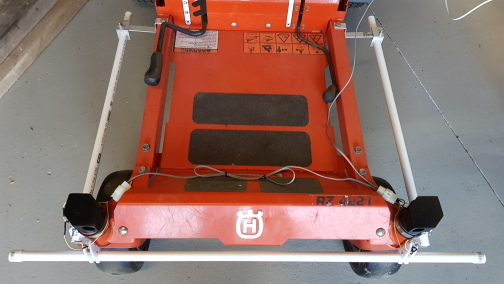 Husqvarna don't even make this mower anymore, presumably because they damaged their brand so much by releasing it. Don't even buy a second hand RZ4221. Seriously, get something better. [/whinge]. There are three main mechanical parts to this project. It's a little hard to see in the clutter, but the black cylinder in this picture moves in and out when the motion control lever is moved by the driver. There is one on each lever. They are designed to slow the movement of the motion control levers to discourage the driver from 'dropping the clutch' (which both knocks the equipment around and tears up the grass). These have about 30mm of travel - stopped=195mm; full-reverse=185mm; full-forward=215mm. Below the damper cylinder (even harder to see) is a push-rod (going off to the left) which goes into the gear-box, and engages drive to the wheels. 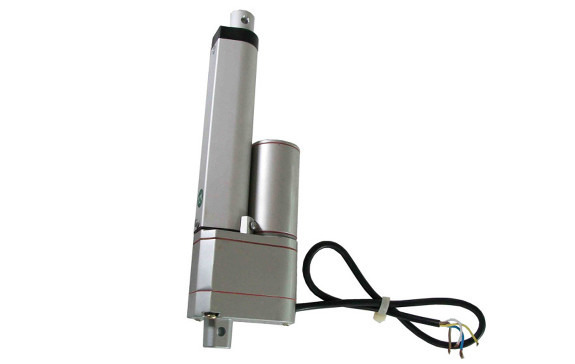 This is a 50mm linear actuator with 10K feedback potentiometer for positioning feedback, and the potentiometer wiper can be connected to an Arduino analog-in pin. (Strangely, the actuators seem to get much more expensive when a $1 feedback pot is added - presumably because they are no longer 'consumer' items). 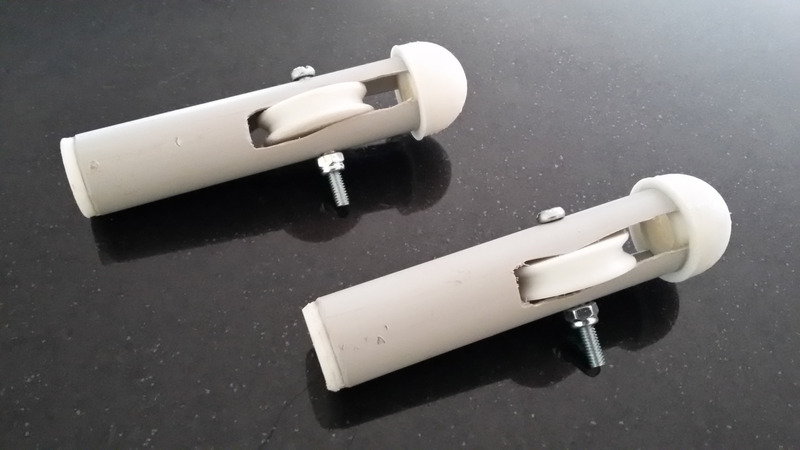 These actuators are almost the same size as the damper cylinders, so it should be possible to replace the damper cylinder with one of these - we just need to put an extension lever on it to translate the 50mm of travel to 35mm. In principle, we could just use 30mm of the 50mm possible movement, but if the actuator moves outside the range, then the system must be designed as to not cause damage. The space in the mower is pretty tight, and the levers have to be quite a distinct shape to make everything fit. These were designed with openscad and cut out on a CNC. We only need two of these, but these were experimental. 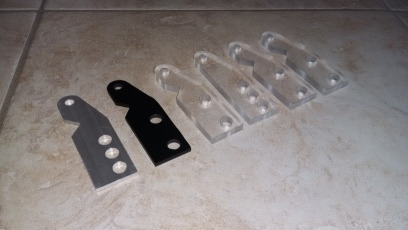 6mm perspex was chosen as a good trade-off between strength and ease of milling. Actually a CNC is overkill for this - a hacksaw, drill and file would be effective here. Here the control levers have been removed, and the damper cylinders replaced with the actuators. It's a little hard to see all the components, but the actuator is connected to the perspex lever, which extends the existing lever (we have to accommodate 50mm of play instead of 35mm with the damper piston). This rotates about the large bolt below it, and below that the lever is connected to the push-rod, going back into the gear-box. Unfortunately this arrangement means that there is no longer any visual indication of where the neutral point is (ie the 'mid-point' at which the wheels move neither forwards or backwards). Hence calibrating the actuators is going to tricky and potentially dangerous. In the end, this was done by lifting the the mower into blocks so the drive wheels could spin freely, and using the manual control to move the actuators until the wheels stopped. Marks were made on the actuators at the neutral point so that the software could be calibrated with the mower turned off. Clearly the wiring needs to be modified to interact with the controller. The mower has a wiring harness which interacts with the brake, seat switch, control levers and blade engage in complicated ways to cut out the engine if something unexpected happens. There are basically two approaches to this. Replace: Bypass the wiring harness and just control the motor directly with some custom circuitry. Faking it is quite complex - powering the motor directly is much simpler. There are three wires into the motor (apart from the ground / 0V wire), a red wire, a black wire and a gray wire. When the engine is running, the red wire and gray wires should be connected to the (+12V) battery anode, and the black wire should float. To kill the motor, the black wire should be held to GND / 0V / battery cathode. Collision detection: like a tripwire being tugged. This should be on a latched relay directly breaking the ignition circuit - that is, is should by-pass the software completely. Excessive tilt: this would indicate that the rover had capsized or was doing something silly like climbing the dam wall, a fence, tree or a building. Unfed watchdog: some critical software process(es) no longer running (or running too slowly). Emergency stop button pressed by a human supervisor. While the logic of the differential drive is similar as the other robots - in practice there is a significant difference. While previously, driving the wheels has been programmable with a 'drive motor at power X', this would require a 'move actuator to position Y to achieve drive motor power X' paradigm. And there are no position encoders. This is not actually a complicated change (it's just a few lines of code), but has safety implications. 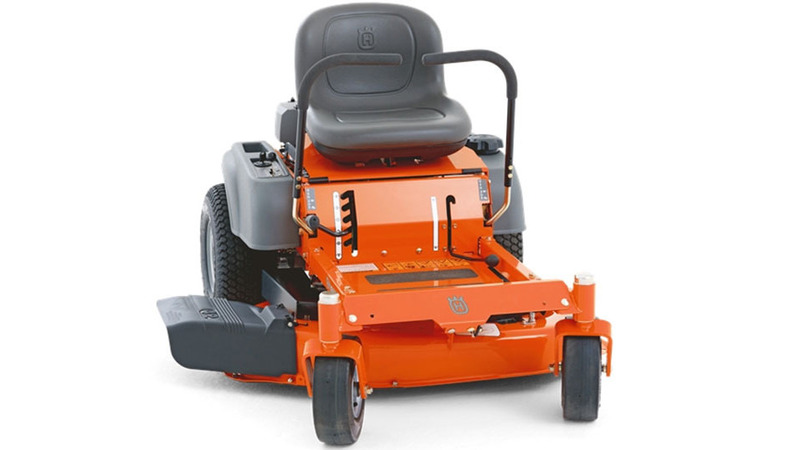 Full rated speed of the mower is around 10km/hr (3.6m/s). The actuator has a speed of 40mm/s (a little less when loaded). Moving from full speed (forward) to stop will be a 20mm movement, and will require 0.5s to achieve. We can expect the mower to move around s = ½at2 = 0.9m in this time. That's rather a lot for an emergency stop. In practice the mower should not be driven at anything like full speed. If it is driven at half speed, the stopping distance goes down to a more reassuring (but still significant) 0.225m. 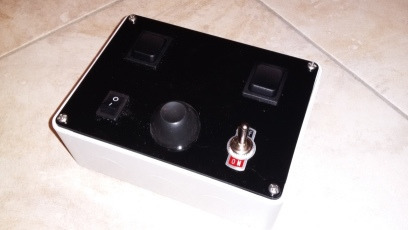 This test box is for manually controlling the unit without a computer. It tests the actuators, and also the electrical system to the motor. 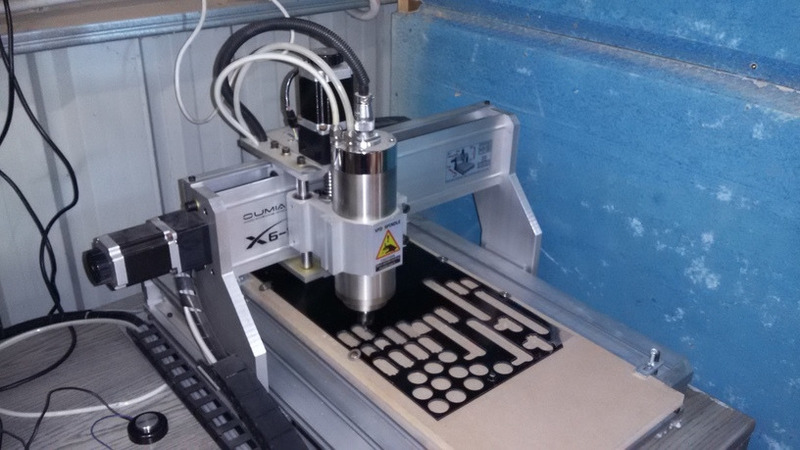 It is a project box, with the lid replaced with a control plate cut out of a sheet of 3mm acrylic with a CNC. There are two two-way toggle switches to control the actuators. On reflection (excuse the pun), black was not the best colour for the acrylic sheet, but I used what I had. There is an ignition switch on the bottom left, a kill switch on the bottom right, and a motor-start button centre-bottom. Even being operated with this control box the machine is quite dangerous - moving the toggle switches back to zero will not stop the machine, but simply leave it moving (or turning) at the same rate. Stopping the machine actually involves moving both actuators back to the zero position. Or emergency-stalling the machine. The electronics was mounted in a plastic project box, and this was mounted where the seat used to be. The base of the box is black acrylic, which turned out to be a very poor choice as it maximises the greenhouse effect with the clear top. Sorry, your browser doesn't support the video tag. Please here for video. The start-up procedure is as follows. Main switch is turned on. This starts the Arduino, which flashes the strobe "1, 2" which is "ready for start-up test", and also boots the Raspberry Pi. Voltages are checked - 12V and 5V. Actuator Test momentary button is pressed, which moves the actuators, and ensures the position feedback is working. Checking that left/right are not swapped and forward/back are not swapped is done by the operator. At this point the remote control unit can be used to move the actuators. The ignition latching relay is enabled - the Ignition Latch momentary button is pressed, latches the ignition relay. Throttle is moved to 'choke' (starting position). 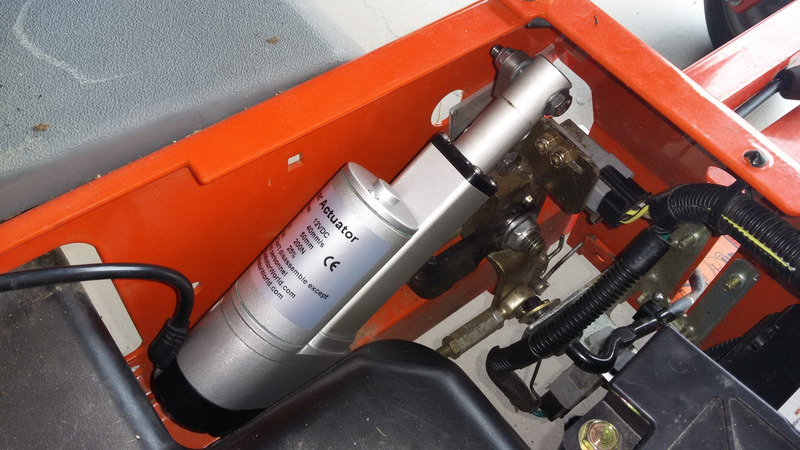 Starter motor is pressed, which engages the starter solenoid, and runs the starter motor. When the engine is running, the throttle is moved to 'run'. The engine can be killed by pressing the emergency stop button or pressing stop on the remote control or by tripping the collision detect. Any of these actions unlatch the ignition relay, stopping the motor. Testing whether wheels actually spin - while rover is off the ground, and also suspended off a crane in case it decided it wanted to explore the workshop. A little trick I picked up from watching videos of SwarmFarm Robotics videos. Those guys rock. The white bits are done on the 3D printer, the grey tubes are (hastily and poorly cut) 20mm electrical conduit. And I was out of M4x25s so I used M4x35s so the bolts stick out. Normally I like to paint robot extremities red, but I only have white 3D extruder. 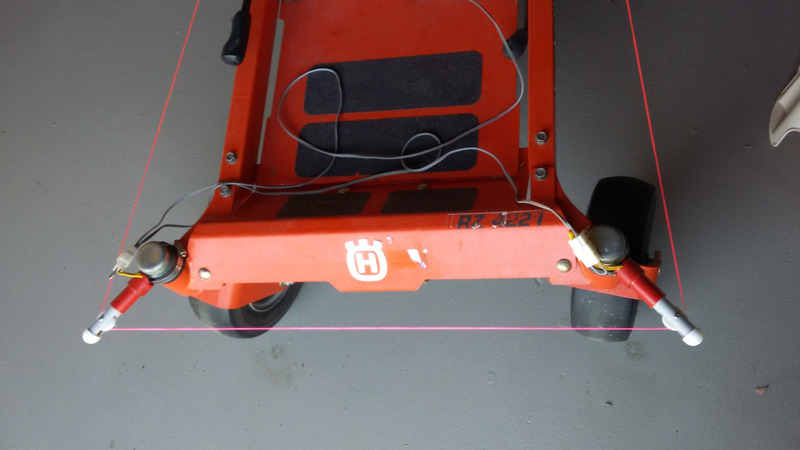 When this is pressed (either directly or via a tug on the pink cable), the circuit will be broken, and the ignition relay will unlatch. A wire going around the front of the unit rigged so that if tripped, the engine will stop. This should be a latching relay which can only be latched/re-latched by a human supervisor, and can be unlatched either by the tripwire or pressing the emergency stop button. I probably should have smoothed out the round cap a bit more - a collision is likely to knock off the soldier's hat. having the whole mower spin (opposite wheels go to maximum in opposite directions simultaneously), making it very hard to jump on and press the emergency stop button. This is actually shot with the older (pre 3D-printer) bumpers. Parking sensors have not been fitted to the holder yet. Yes, it actually works - as a remote controlled vehicle anyway. This is not yet autonomous. The IMU/DGPS box is not yet fitted, nor is the lidar sweeper. This is just a test of the mobility and safety shutoff. Testing the IMU - compass. A simple program to point north/south/east/west. The IMU and DGPS box is now fitted but not the lidar sweeper. This test is autonomous, but just changes the orientation of the rover- effectively a test of the compass and steering algorithms. The final directions are not very accurate - the system deliberately has large dead-zones and slop so these can be tightened up later. Over-constraining these too early is likely to stress the actuators - which are only rated to a 50% duty cycle. Making the rover follow a pre-programmed way-point course in the paddock. Out in the fields, following a rectangular way-point around the paddock. The DGPS and compass (IMU) are used to navigate around the paddock. Next step: Tighten up the steering parameters (to reduce the 'wander'). And then: Collision avoidance, either the lidar sweeper or the ultrasonic parking sensors. There is no need to replace the throttle with an actuator. The glory of lawn-mowers, they have a governor, which can simply be set manually. The mower is much lower without a seat or an operator. This means the mower can go under trees and bushes - though this creates navigation and collision issues. An Arduino is used to just control the actuators for the control levers. There are many reasons for this - if the main computer crashes, the Arduino can trip the emergency stop button and also bring the actuators to the stationary position. Also, the Raspberry Pi is very susceptible to crashing with unstable voltage supply, the Arduino is considerably more robust, but not sophisticated enough for the navigation and decision making. Pretty much the same software as the GizMow except with a larger wheel-base, wheel-size and rover-length. An extra class can convert drive motor goals to Arduino actuator commands. Better mowing algorithm - still working on this. Others doing some cool stuff.